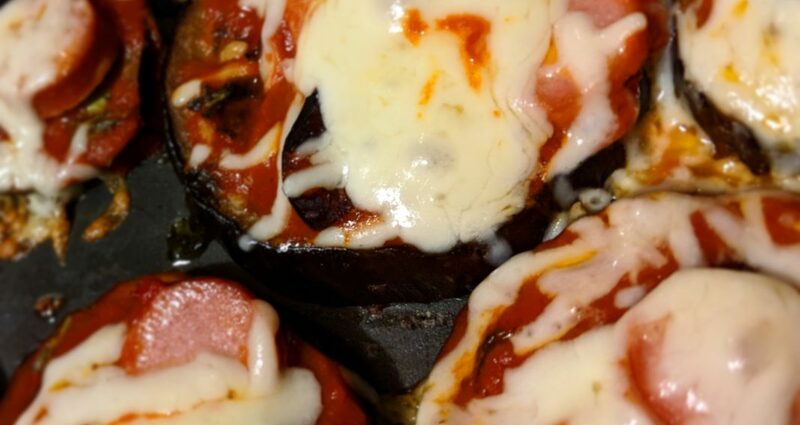 In this summer recipe we will use an aubergine as a pizza base – you can choose whichever toppings you like. Cut the aubergine into 1 cm round slices and sprinkle with sea salt. Leave for 2 hours to sweat out some excess water then pat dry with kitchen paper. Marinate the aubergines: chop the garlic, basil and fresh oregano (or, if you are using dry oregano, add it later) and spread over the aubergine slices. Drizzle with 1 tablespoon of olive oil. Leave to infuse for at least 1 hour. Pre-heat the oven at 180 degrees Celsius. In a roasting tray, drizzle 1 tablespoon of olive oil. Place the aubergine slices side by side and roast for 20 minutes. Spoon some tomato passata on each roasted aubergine slice, add the olives and mozzarella. For a non-vegetarian option, add Frankfurter slices. Roast for another 10 minutes at 200 degrees Celsius. Serving suggestion: the smaller slices can be good for canapes or antipasti, while the larger slices can be served as a main. For a main course you can serve 3-4 large slices per person.